Attention conservation notice (h/t Cosma Shalizi)This is a purely (well, hopefully not, actually) self-aggrandizing break from debate mastication. I’m pretty sure this crowd knows by now that I host an internet radio show once a month (one of three hosts in the (almost) weekly slot) on science and its surrounding culture. The strand is called Virtually Speaking Science, and it’s part of the expanding Virtually Speaking empire created by Jay Ackroyd, a commenter here and a front-pager over at Atrios’ place, Eschaton. I’ll be doing another netcast this evening, October 17 at 5 p.m. EDT — and it’s going to be a good one, I think. To get a sense of some of the issues to be discussed, what’s notable about this picture? But you may notice a certain common attribute shared by the figures depicted here — which visible evidence of the historical reality of career paths in the sciences is something my guest, Professor Nancy Hopkins, has done as much to change as any single person in the American academy. Hopkins, an MIT colleague is both a top flight biologist (her research has focused on development and cancer and she is particularly well known for her work on zebrafish as a model for basic questions in developmental biology) — and a real hero of the drive for gender equity at MIT and really, throughout the tier 1 research university world. As often happens with top flight researchers, she is part of a lineage of scientific inquiry that provides a glimpse of the creation story (myth?) of molecular biology — as she was trained by Jim Watson and Mark Ptashne — and the Watson connection is rich in this context. Hopkins managed to advance the cause of gender equity in the 02139 zip code the MIT way — confronting real barriers to her own work, she found the handful of other women faculty in the sciences similarly constrained, and then went to central administration to get support for a study. She and her colleagues then went out and did that radical thing, collecting actual data on measurable aspects of faculty research experience: how much space, when, what kinds of support and all that. She and her co-workers were able to demonstrate clear and significant discrimination, and to their and the Institute’s credit, central administration responded with real measures to address the issues raised. A report published in 2011 documents the changes within MIT [PDF], and it notes both significant change and considerable room for further progress. By the way — just to link up with another of my recent conversations, Hopkins and her colleagues lived and have now documented the same phenomenon Ta-Nehisi Coates wrote about so powerfully in his piece “Fear of a Black President.” Women in science have had to fight through the “twice as good” demand and constraint for a long, long time — and to a greater extent than should still obtain in this century of the fruitbat, they still do. That’s where Hopkin’s work is now taking her, as she documents how the playing field within and around the academy is still far from level. We will talk about that work too. Do tune in if you have a moment, and/or pick up the podcast (either at Blog Talk Radio or on iTunes) within a day or two. Oh — by the way. No binders were harmed in the making of this post. *completely off topic, but I found W.G. Sebald’s The Rings of Saturn to be incredibly moving — and he has a wholly strange and wonderful discussion of this painting early in the text. 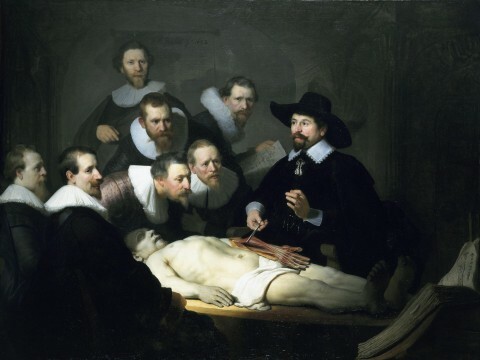 Image: Rembrandt van Rijn, The Anatomy Lesson of Dr. Nicolaes Tulp, 1632. This entry was posted on October 17, 2012 at 11:16 am and is filed under Gender, radio, Science, Self-aggrandizement. You can subscribe via RSS 2.0 feed to this post's comments. How am I not a distinguished guest?!?!! MIT has a long history of women getting out and doing the research, and often finding the institute taking action. A friend of mine back in the 70s documented the dearth of women’s rest rooms at MIT, producing not just a dry statistical document, but a rather enlightening slide show. (OK, it was funny the way she told it.) In response, MIT converted a good number of men’s rooms into women’s rooms. As usual with so many important changes, the new generation tends not to recognize the changes. I just assumed the 5th floor women’s room in building 9 had always been for women until late one evening a member of the janitorial staff insisted I check it out for myself as he had never seen a women’s room with “pisspots” before and had to share this remarkable discovery with whomever was around.